To Skarv on the "Ships starting with S" page. Received from Kåre B. Kristiansen, Norway (whose grandfather served on Fagersten, among several others). Delivered in July-1923 from Porsgrunds Mek. Værksted A/S, Porsgrunn (82) as cargo vessel Frank to A/S Frank (Chr. J. Reim, Porsgrunn). Steel hull, "Porsgrunn-type" (engine aft and bridge amidships), 212' x 32.2' x 12.4', 930 gt, 1300 tdwt, Tripple Expansion (Porsgrunds) 103nhp, 9 knots. Sold in July-1929 to Rederi-AB Alfhem (Sam Andersson), Gothenburg. Sold in Sept.-1932 to Otters Rederi A/S (Rich. Otter), renamed Skarv. The above documents were helter-skelter, but I believe I've managed to get them in the correct order. Errors may exist. This could also mean that she may not have sailed in all the convoys mentioned here (where the "Convoy" column is left blank it means that convoy is not known). Also, several voyages are missing. May 16 Sunderland Southend May 18 FS 172 Compare w/Page 1 above. Rendezvoused w/OB 234, Oct. 26. Page 1 gives arrival Liverpool, Oct. 28. Jan. 24 Methil Oban Jan. 29 EN 61/1 Did not sail. *Page 4 gives arrival Belfast, Jan. 30. *Page 5 gives arrival Liverpool, Apr. 13, Loch Ewe Apr. 27. May 11 Methil Oban? * May 13 EN 83 *For Preston? July 13 Methil Silloth July 15* EN 110 *Page 6 gives arrival July 17. Aug. 22 Methil Silloth Aug. 24* EN 127 *Page 6 gives arrival Aug. 26. Nov. 9 Methil Belfast* Nov. 11* EN 160 *Page 7 gives arrival Stornoway Nov. 12, Belfast Nov. 15. Dec. 6 Methil Belfast Dec. 8* EN 170 *Page 7 gives arrival Dec. 11. Apr. 12 Methil Clyde* Apr. 14 EN 216 *Loch Ewe. More missing movements, Page 8 above. Aug. 17 Methil Newport* Aug. 19* EN 269 *Page 9 gives arrival Holyhead Aug. 20, Newport Aug. 22. Page 9 & Page 10. The above voyage is not included on Page 11. Note also that some of the following voyages are not detailed on the document and, therefore, comparison cannot be made and accuracy confirmed. *Page 11 gives arrival Plymouth, Aug. 6. 1945 Jan. 6 St. Helens Roads Newport Jan. 8 TBC 29 Earlier 1945 movements, Page 12. Febr. 3 St Malo Barry Febr. 5  Missing movements, Page 13. May 12 Falmouth Newport May 13 TBC 154 Convoy available at link above. Please follow the convoy links provided for more details - several Norwegian ships took part. For information on voyages made in between those mentioned here, please see the documents received from the National Archives of Norway and A. Hague's Voyage Record above. Skarv is listed in Convoy HN 6 from Norway to the U.K. in Dec.-1939/Jan.-1940. Via Methil (Jan. 4) she's said to have arrived Shields on Jan. 7, with final destination Grimsby. She must have gone back to Norway again, because A. Hague has also included her in Convoy HN 12 from there on Febr. 16. Early in March, he has her in the U.K.-Norway Convoy ON 17, and later that month she's listed in the original Advance Sailing Telegram for Convoy HN 20 from Norway, bound for Sunderland in ballast. According to Page 1 of the archive documents, the intention was to return to Norway from Sunderland on Apr. 6, but due to the German invasion on Apr. 9, she was diverted to Boulogne, where she later arrived, via Methil, on May 7. Apart from a couple of voyages to France in May and June that year, she was subsequently in service around the U.K., enduring many attacks by aircraft and E-boats. With the Norwegian Elna E, she's listed in Convoy OA 234, departing Methil on Oct. 24-1940. On Oct. 26, this convoy joined up with Convoy OB 234, which also included Austvard and Grey County - ref. links provided in the Voyage Record. Skarv arrived Liverpool Oct. 28. In May-1944, she was in Swansea, loading war stores for the invasion of Normandy. "Nortraships flåte" states she arrived June 7 and left again on June 11 on her first trip. According to a personal story I have found, Skarv was scheduled to be at Omaha an hour after the first soldiers had been landed. She also had on board about 100 American soldiers who were to be used for the unloading of cargoes. On her second trip to Omaha her crew learned that all(?) of these soldiers had died. Skarv made several trips back and forth to Omaha Beach. Her voyages in this period are shown on Page 11, but her trips to Normandy are not detailed. However, A. Hague has suggested some convoys for some of them in his Voyage Record above. Page 12 has the rest of her 1944 voyages, as well as some early 1945 voyages. According to Page 16, she went home to Norway in Dec.-1945, and again in Jan.-1946, as well as in March that year. More information on the other Norwegian ships mentioned above can be found with the help of the alphabet index at the end of this page, or go to the Master Ship Index. Converted to oil fuelling in Febr.-1952. 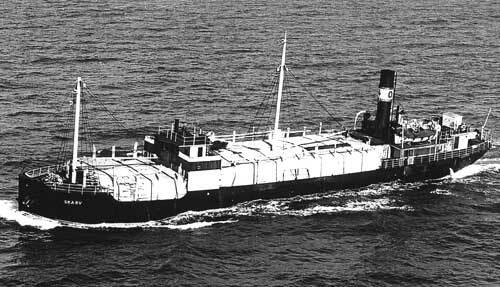 Sold in Dec.-1953 to Holderness SS Co. Ltd., Hull and renamed Holdernain. Sold in 1963 to Cozrelwaves Ltd., Hull and renamed Emmanuela. Laid up at Trieste, Italy May 12-1963. Sold in Sept.-1964 to unknown breakers in Trieste for breaking up. Back to Skarv on the "Ships starting with S" page. The text on this page was compiled with the help of: "Nortraships flåte", J. R. Hegland and misc. Pre war and post war info was received from T. Eriksen, Norway - His source: Article about Chr. J. Reim by Kjell Malmgren and Dag Bakka Jr. in "Skipet" 4.88.